As your infrastructure grows and expands to meet the expectations of today’s digital economy, any cost savings you gain from commoditized hardware is quickly overshadowed by the complexity of managing and supporting disparate systems. There is, however, a method of mitigating this issue. 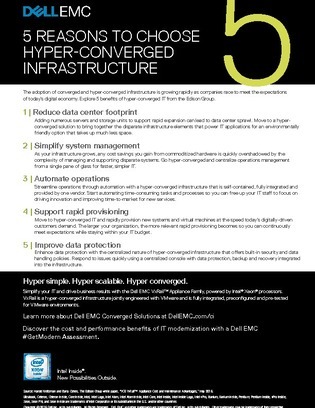 Download this paper to learn how to eliminate this complexity and automate time-consuming tasks and processes by consolidating your systems with hyper-converged infrastructure (HCI). You’ll discover how to use HCI to drive innovation, improve time-to-market for new services, and 4 other benefits outlined inside. Dell EMC Solutions are powered by Intel®.